My husband, son, and I are wearing Star Wars themed costumes this year! We both love star wars (our son's nursery is even star wars themed) so we thought it would be a great fit for Halloween. The Queen Amidala costume that I am wearing is actually a past costume I wore over 20 years ago! 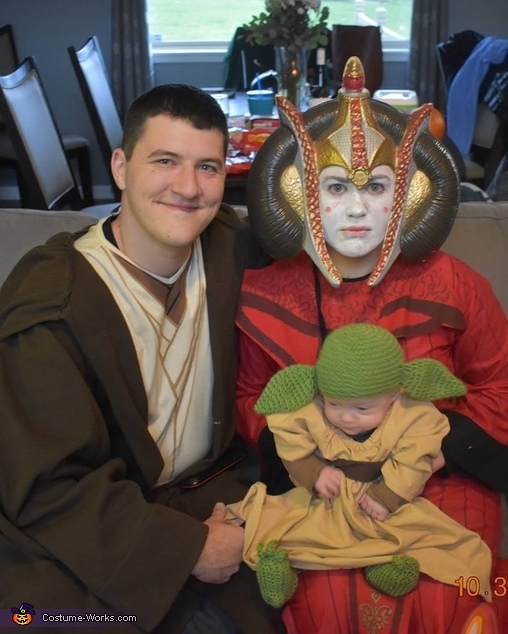 My husband is wearing a traditional Jedi robe costume and our son is baby Yoda! The Baby Yoda headpiece and booties were bought on Etsy but we did make his robe. We used a basic piece of flannel material and created a poncho. We then sewed arm wholes into the poncho to give it a more defined look and used dark brown material to create the sash.